Rookie sailor's dream ended in disaster after he ignored warnings about his plans. The last photograph of doomed Melbourne yachtsman Neil Qualtrough, who ignored warnings about his plans to sail solo across the Pacific. AN inexperienced sailor refused an offer of help before he set sail alone from Hawaii, headed for Victoria, and was never seen again. Neil Qualtrough's only sailing experience was spending an afternoon on a yacht with a friend, but he appeared relaxed as he posed for a photo leaning barefoot against his vessel in the days before he set sail. His daughter Sarah had tried to talk him out of making the long voyage, but 63-year-old Mr Qualtrough was “nonchalant” about the trip. It had been his dream to purchase a yacht and go sailing. Mr Qualtrough, a former Melbourne man, had deliberated about whether he should sail solo or take a crew, but he decided to go it alone. An American man who had sailed with Mr Qualtrough was concerned that he didn't appear to be familiar with the system of buoyage used in Hawaii and therefore was steering his yacht improperly, an inquest into his death heard. Mr Qualtrough left Honolulu on about June 6, 2007, planning to stop in either Tahiti, Fiji or Samoa en route to Australia, but never made it. Victorian Coroner Jennifer Coate today said she was satisfied Mr Qualtrough had apparently failed to safely make it to his first destination. “He has not been in contact with his daughter Sarah, much to her distress, since that time,” Judge Coate said in her finding. Since an inquest was held in August last year a new witness has come forward who spoke with Mr Qualtrough in the days before he set sail. David Pawley, who was working in Honolulu as a marine engineer, spoke with Mr Qualtrough in May or June 2007 after a US national expressed concern to him about an Australian man preparing to sail home. Mr Pawley provided investigators with a photo of a grey-bearded and barefoot Mr Qualtrough dressed in shorts and a T-shirt leaning against his yacht. Mr Pawley said it was his belief that Mr Qualtrough's proposal to sail to Australia was not a good idea, but he was determined to go. 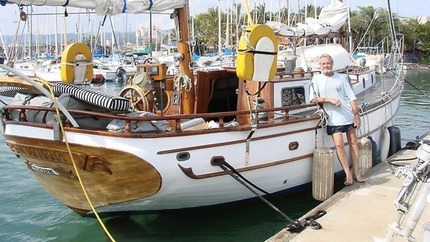 Mr Qualtrough, who was a fitter and turner in the merchant navy and an engineer, had lived in outer suburban Melbourne for 35 years, had always dreamed of owning a yacht and had decided it was cheaper to buy one in the US and sail it home. He worked on the yacht in Hawaii for six months, making repairs to it before he set sail. Searches of Mr Qualtrough's bank and stock exchange accounts indicate they have not been accessed since June 2007.